As you set out for a ride, you always expect that it will turn out to be fun and enjoyable. But you also need to be well prepared for the unexpected. Having the necessary bike accessories will determine whether your ride will be a success or one full of frustrations. Among the most important one is a bicycle pump; an accessory that keeps your tire fully inflated. 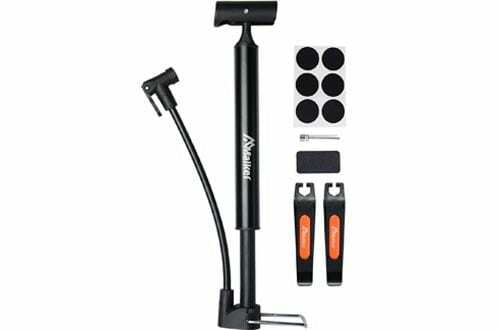 Sometimes you need a bike pump that’s just more than adequate – one that can help you out in emergency situations. This is where bike floor pumps come in handy. These pumps are designed for quick air transfer with lots of flexibility to benefit from. 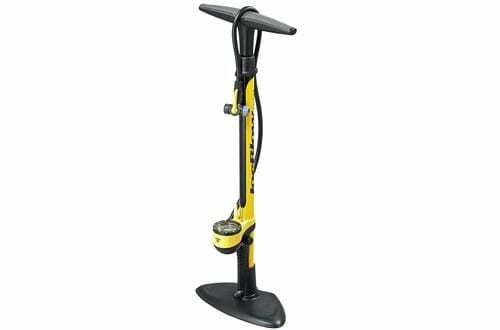 With many different models out there, getting the best bike floor pumps can be quite tricky. That said, you need to be cautious and understand the factors and features that matter most. Among the few things you need to consider are high inflation pressure, accurate/easy-to-read pressure gauge, multi-valve functionality, swivel options, and durability. You might also want to consider weight and size in case you’re planning to go for a longer ride. Going through such considerations might take lots of your time. That’s why we’ve prepared a list of the best bike floor pumps to make things much easier for you. 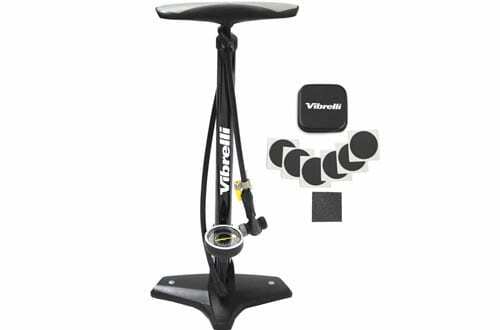 This bike floor pump is a perfect option for social and competitive riders. It sports an advanced “Rapid-T valve”; one that switches with ease between Schrader (car style) and Presta (racing style) valves. Everything is kept airtight making the pump leak proof. The pump has an inflation pressure of 160 psi and delivers a high volume of air with each stroke for faster inflation. The pressure gauge comes large, accurate and easy to read. 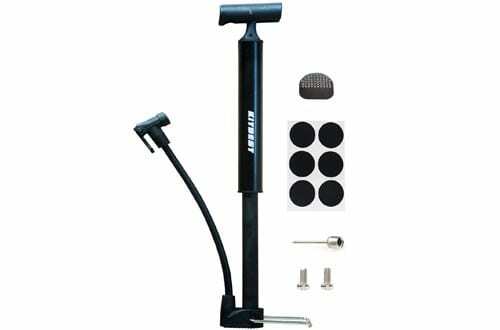 This bike pump is housed in a steel barrel and sports a heavy nylon base plate for optimized durability and stability. A glueless puncture kit comes in handy whenever your tire goes flat. This is a sturdy, compact multi-valve floor pump. It’s compatible with Presta, Schrader, and Dunlop valves for improved versatility. The pump has an inflation rate of 140 psi so you don’t waste any time to get a full tire. A metallic barrel gives it a sturdy profile that prevents rocking during the pumping action. There are multiple swivel positions for perfect alignment of the hose. The pump has an extra-large, built-in pressure gauge that’s accurate and easy to read without having to crouch over. Storage clips are included so that the pump tucks away nicely. 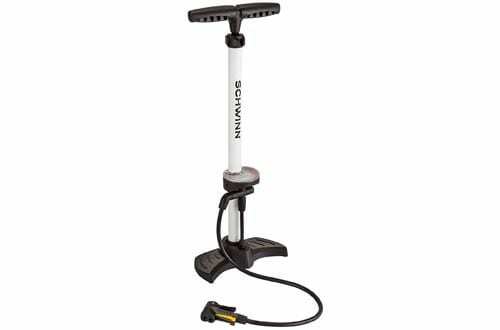 This is a mini floor pump; one that comes almost weightless and compact to attach on the bike frame. The barrel is made of aluminium alloy making it ultra-lightweight with a durability you can depend on. 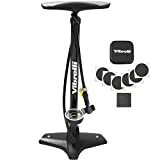 This mini bike floor pump is among the most powerful out there. With its dual pumping action, the pump provides an impressive 130 psi for faster inflation in emergency situations. It’s compatible with both Schrader and Presta valve tubes. There’s a glueless puncture kit to service you in case your tire goes flat. Save yourself the energy of having to carry around a bulky floor pump. This mini bike floor comes as lightweight as it can ever get. It provides an ultra level of lightness and durability; a perfect combination that makes easy work of tire inflation. The pump is compact enough to easily fit on the bike frame and sports an aluminium barrel with a protective coating. The pump has an inflation pressure of 130 psi, which is quite impressive for its size. It’s compatible with Presta and Schrader valves. The pump comes with tire levers and glueless puncture kit for added convenience. This top-of-the-line floor pump comes in handy to fit professional and amateur needs. It’s fabricated from high-quality materials to provide a performance you can really trust. This floor pump is tested to the required standard and sports a double-sided twin head, a feature that provides great compatibility with Presta and Schrader valves. The hose comes extra long for extended reach and you get a 360-degree swivel for easy, tangle-free positioning. The base comes wide and is made of heavy-duty steel for improved stability. A large, accurate pressure gauge is integrated on the pump for easy monitoring of pressure level.